Staples, the miniscule invention that many associate with the drudgery of the office, but for one artist, they are just another tool of the trade. 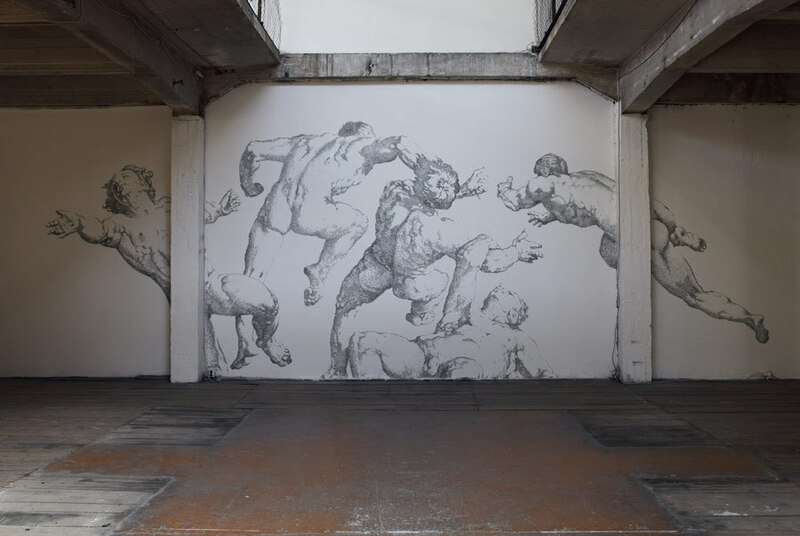 Baptiste Debombourg used staples to create a stunningly intricate mural at the Karlin Studio in Prague. As an homage to the technique of engraving, Debombourg used 450,000 staples in his site-specific work, choosing his materials based solely on where the piece will be exhibited. "My sculptural work is generally part of a contextual approach, and I operate in a space with materials chosen specially for it," the French artist says on his website. The subject matter for "Aggravure III" revolves around collapse and deconstruction -- a frequent theme in Debombourg's source material, where classic paintings tell the stories of mythological heroes. The artist writes, "Here the staple is a material and a media that plays with contemporary aggression, with everyday life’s secular usefulness." Debombourg even goes so far as to claim that the male-centered mythological and religious themes are present today in our cult of the superhero and bodybuilder. View a slideshow of "Aggravure III" below. What do you think readers? Let us know your thoughts in the comments.